Perhaps a day at the races with the right skills and knowledge could be quite profitable, but for me (first time in over a decade), it certainly wasn’t a money maker — it was about the company. Quite a glorious day, relaxing, standing in the sunshine, chatting to the blokes I was with, pondering horses and bets, and watching the races as they happened. Drinks $7.50 for a can of beer, $4.80 for a bottle of soft drink = $19.80. Was interesting to see stricter limits of 2 cans of alcohol per purchase after 4pm. I can’t say I saw any alcohol-related problems. 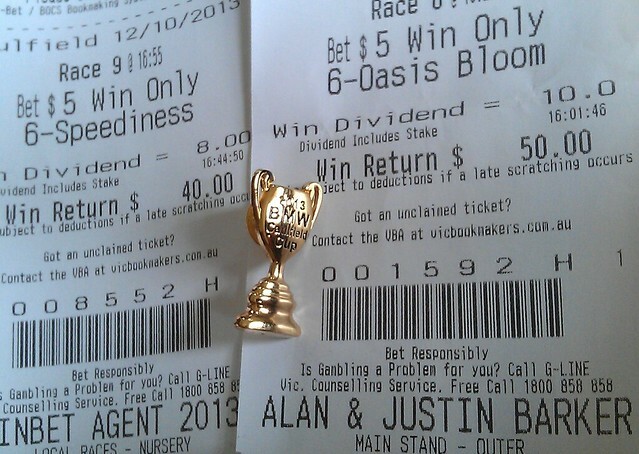 I didn’t splurge on bets, but did put $5 each on Oasis Bloom (which came second) and Speediness (which came fourth) based on tips from friend of a friend, as well as liking the names — perhaps not the best strategy ever, but the best one I have. Caulfield Guineas day isn’t the busiest day of course. They had said at one stage they reckoned a crowd of about 25,000. Seemed well-behaved from where I was standing. For the men there was a mix of casual dress and suits — probably more of the latter in the public areas, even more so in the more exclusive sections no doubt. Most of the ladies seemed to be in frocks. A few people were in fancy dress — I saw one Star Trek captain (a Trek tunic, plus a sailor captain’s cap), and several people in animal suits, though they’d all taken off the heads as it was pretty warm. And the winner of the feature race? Long John. There seemed to be plenty of staff and extra trains at Caulfield station afterwards, so getting home again wasn’t an issue. I wonder how they’ll cope on the really busy days. 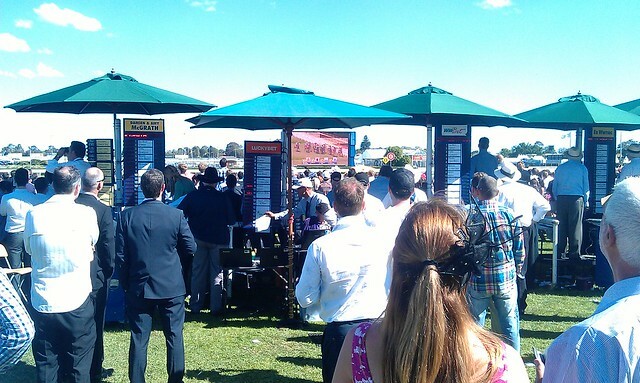 Caulfield can get really busy when there are races, or other events, at Caulfield Racecourse. I saw some aftermath of excessive indulgence at the races in the early evening. I don’t know how many people used trains to attend the event, but Dandenong Road was chockers with motor traffic after the event finished. Did I read correctly? You have to PAY to get in? So you can lose your money. I hope the charity got some of the $45. No wonder the casino is so popular.